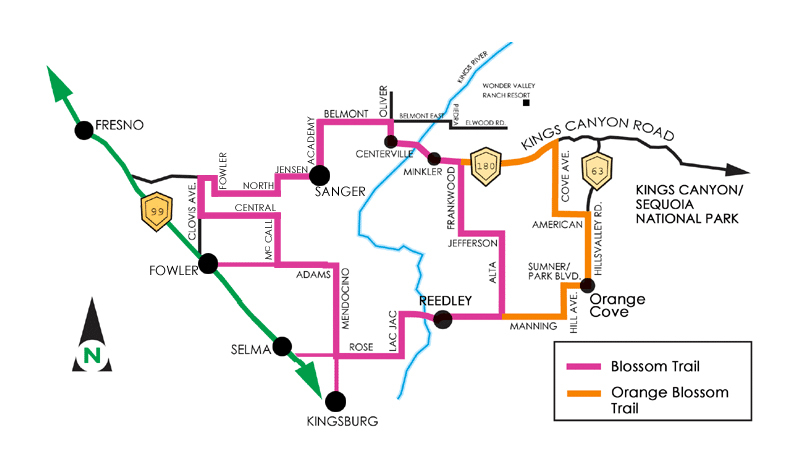 Take this self-guided motor or bicycle tour, organized by the Fresno County Blossom Trail Committee, a partnership between the County of Fresno and the Chambers of Commerce in Sanger, Kingsburg, Reedley, Orange Cove, Selma and Fowler to celebrate and feature the beauty of Fresno County’s agriculture and a few historical points of interest. Traditionally the best time to see the Blossom Trail is from the end of February through the middle of March. 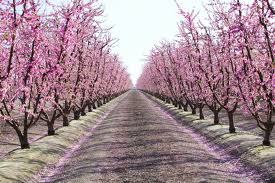 Panoramas of orchards full of fruit trees alive with fragrance and bursting with blossoms await you. The blossom season begins in February and runs through March. For your greatest enjoyment, plan to visit during this time. Come back in the summer to taste the delicious fruit. Plum Blossoms are white. At least two varieties will be planted in an orchard for cross pollination. Over 200 varieties are grown commercially. Harvested in mid to late September. Citrus Blossoms are white with most aromatic fragrance. Navel and Valencia oranges, and lemons are the most common citrus grown locally.